When Walt Disney died of lung cancer in 1966, he left behind a company that had no idea how to function without him. Right down to the corporate name, Walt Disney Productions had largely been a cult of personality, and once that gargantuan figure was out of the picture, nobody behind the scenes or in the audience had any idea what to expect of a "Disney picture". The short-term solution came in two forms: first, whatever projects had been started during Walt's lifetime, no matter how little along they were in development, were the first priority; the mere hint of the man's authority was enough to guide a nervous, untethered studio in the first years of what would prove to be two decades of wandering in the wilderness. Thus came, for example, The Aristocats, surely one of the noblest uses of the Disney brand name in history. The other solution, one that became more and more prominent as the 1970s progressed, was to cannibalise the studio's own past successes in the absence of any new creative direction. This begat The Biscuit Eater, a retread of Old Yeller, Herbie Rides Again, and a new cycle of "let's find the next teen star" pictures attempting to repeat the success of Disney's vehicles for Hayley Mills. 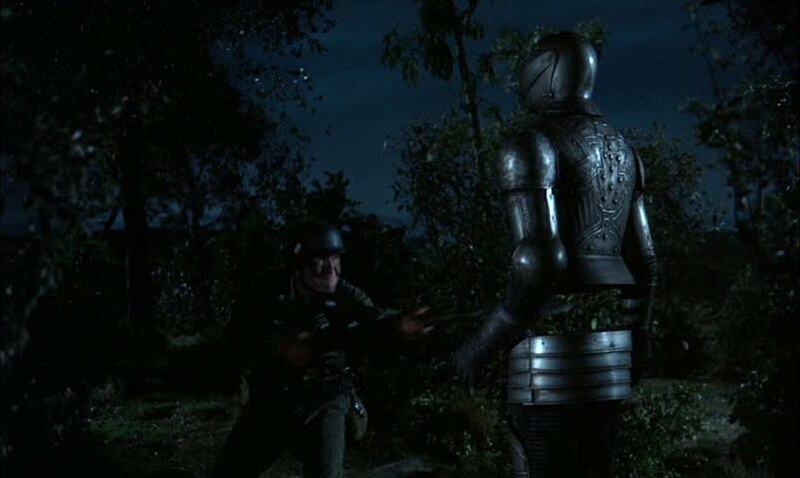 Needless to say, there were projects that combined these two approaches, of which the most prominent is assuredly 1971's Bedknobs and Broomsticks. The idea of adapting Mary Norton's pair of 1940s children's novels featuring apprentice witch Miss Price (The Magic Bed Knob, or, How to Become a Witch in Ten Easy Lessons and Bonfires and Broomsticks) first floated into view in the late '50s, when the studio was looking to make a live-action fantasy picture, and had been repeatedly stymied by P.L. Travers, whose series of books about a magical nanny had long been a ripe target in Walt's eyes. Bedknobs and Broomsticks was not terribly far in development, however, when Travers relented, and the result was Mary Poppins: one of the biggest hits in Disney history, a critical triumph, one of the all-time iconic family movies from that day till this, et cetera ad infinitum. Disney being just as human as anybody (and probably less than that, around the turn of the '70s), the desire for a second Mary Poppins was understandable and overriding. Of course, the ideal situation would have been the most obvious, Mary Poppins 2; but given Travers's well-noted horror at what she considered an Americanised hatchet job of her novels, the likelihood of getting her to sign off on a sequel was somewhere south of 0%. But there was that Mary Norton project, sitting right there, just waiting to be turned into a spectacle of songs, magic, and an uncertainly wedged-in animated sequence. It was put back on the fast track and turned into something not very much like Norton's books at all, but something very similar indeed to Disney's 1964 smash: in 20th Century England, sad little children meet a prickly magic woman with whom they have many adventures and learn important things about life, aided by several new songs by Richard and Robert Sherman. David Tomlinson is in the cast; Robert Stevenson is in the director's chair; and nearly all of the crew heads are back in place (the exceptions: new cinematographer Frank Phillips and production designers Peter Ellenshaw and John B. Mansbridge). And this time, there are fumbling comic Nazis! 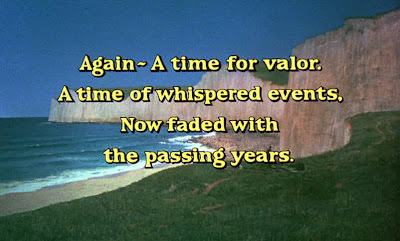 Yeah, Nazis - the film is set in August, 1940, as we learn right at the start, in a pair of title cards whose florid language would be a better fit in a silent melodrama that a kiddie flick from the 1970s, but since when did they ask my opinion on these things? 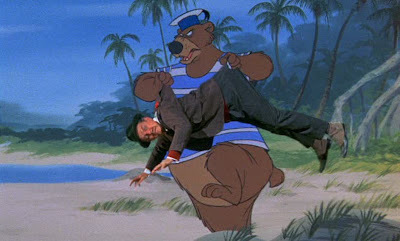 I do not recall if, as a young boy, I was terribly put out by the Nazis (Bedknobs and Broomsticks was a staple of my childhood viewing, moreso even than Mary Poppins, though unlike Mary Poppins I did not keep up with watching it, and prior to 2009 had not seen it in every inch of 20 years). But I am terribly put out by them now, and not in some huffy, puffy moralistic way, "egad, we must not trivialise the events of World War II by making Nazis into comic villains". Heck, maybe we even shouldn't, though I'm rather talking more about the simple weirdness of a Disney movie with Nazis - for better and for worse, Disney movies have a tendency to exist out of history (though it's not impossible to read Mary Poppins as a veiled - oh so veiled - satire of the declining British Empire), paying little heed to things that have actually happened in the world, and to see actual honest-to-God Nazis in a Disney film... you don't expect that kind of thing, anyway, though it sets up a pleasing opening comic number with two old Brits, a kooky country sort and a starchy military officer, who both keep pronouncing the word as "Nazzies" which is my favorite cartoon English accent word ever. 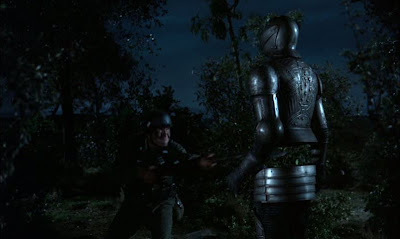 World War II - not a factor at all in the books - is at the very front and center of Bedknobs and Broomsticks from the first: the central drama of the film concerns the three Rawlins children, Charlie (Ian Weighill), Carrie (Cindy O'Callaghan), and Paul (Roy Snart), whose parents are dead and whose aunt just died in the Blitz* and who have been sent to the tiny village of Pepperinge Eye with a number of other children to wait out the German bombs in safety. There they are assigned to live, to pretty much everyone's dissatisfaction, with Miss Eglantine Price (Angela Lansbury), a wealthy young heiress who is much admired by the villagers despite being altogether odd. Miss Price, it quickly turns out, is training to be a witch, and to keep the children silent, she offers them a present of a bedknob, enchanted with a traveling spell: just turn it, and you can go wherever you like. At about the same time, she receives word that the War has forced the closure of the correspondence school from which she has been taking witching lessons, right before she was to receive the last spell in the curriculum. And this is doubly upsetting, for Miss Price had it in mind that this very same spell would give her the ability to help fight off the Nazis. So she and the children fly on the bed to London, there to find Emelius Brown (Tomlinson), who is not a dean of witchcraft at all, but a gregarious conman who was selling what he regarded as gobbledygook words from a dusty old book. Miss Price knows better, and she, Brown, and the children embark on a journey to find the remainder of the spell, just in time to use her new skills to repel a small Nazi invasion. In the words of the colonel (John Ericson) leading the attack, "just a little exercise. A minor raid to induce panic and spread a little mischief". 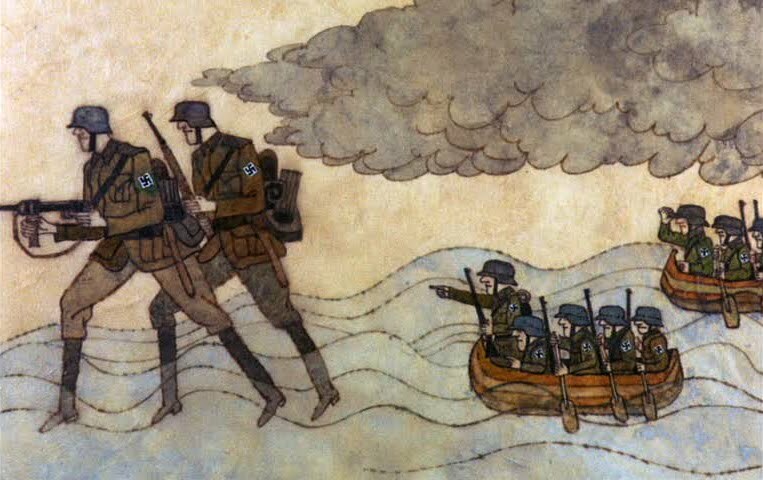 Oh those Nazis! Such mischief-makers all the time! 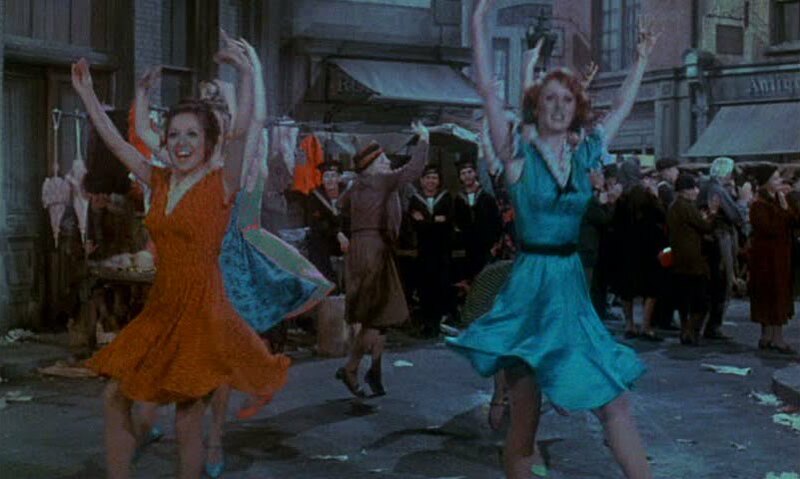 On the whole, Bedknobs and Broomsticks is a fun, fairly intelligent, unexpectedly witty example of cinema for children at a time when that genre was at one of its lowest-ever ebbs. It tells a story that is, at the least, compellingly odd; it is graced by characters that are easy to like and well-played by game professionals. I would say that its reputation is on the soft side: though Disney has, over the years, treated it to some really fine special edition DVDs and largeish theatrical re-releases, it seems to be more a movie that people have heard of than seen, unless it was simply ages ago that they saw it last. It deserves better than that fate, though it would be a lie to claim it as some lost masterpiece: a perfectly fine family movie that's definitely better than it has to be, and good for a wholly untroubling night of escapist cinema. Undoubtedly, the film's grand, overriding flaw is simply that it's not Mary Poppins. It's easy to compare the two on virtually every particular, and easy to find the earlier picture vastly superior at every point, save perhaps for the performances by the child actors. I've seen it claimed that Bedknobs and Broomsticks improves on its predecessor through having a clearer narrative through-line, and a better-expressed conflict; this is almost true, though it begs the question (Mary Poppins, after all, doesn't exactly suffer for having muddy conflict and no narrative spine), and ignores the fact that Bedknobs and Broomsticks spends most of it running time as a series of episodes connected by a quest framework that the screenwriters Bill Walsh and Don Da Gradi sometimes forget about a little bit. And which running time did I have in mind when I said that? For the film, much against the wishes of director Stevenson, was cut by a good 20 minutes after its underwhelming premiere. It wasn't until 1996 that the film was partially restored for its anniversary, though with the lack of a musical number for which only audio elements survive. This 139-minute cut (including restoration credits) is the easiest way to see the film now, and for the most part, it's an improvement: the editing in '71 was done without any particular grace, leaving loose ends here and there, most damnably a subplot involving a seedy minister, Mr. Jelk (Roddy McDowall), reduced to just enough screentime in the original cut that you are left with absolutely no idea what the hell an actor of McDowall's profile was doing in a cameo that somehow managed to get third billing. 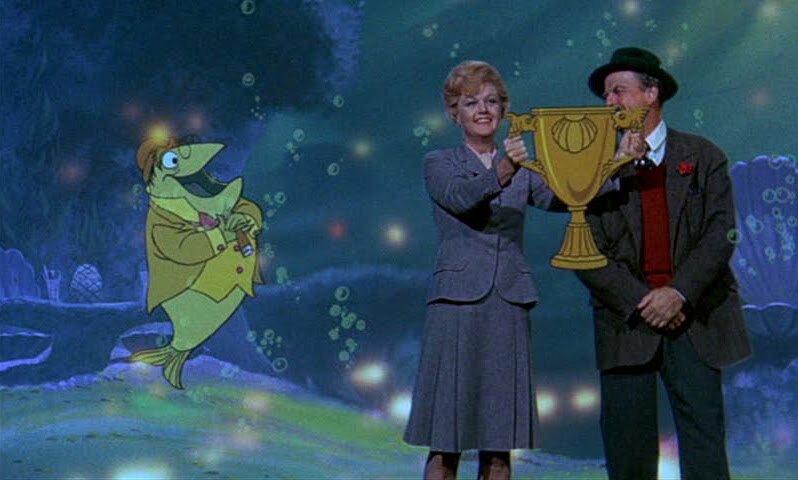 The longer Bedknobs and Broomsticks is generally fuller and more coherent; subtly different at best, but for the better. Mostly. One of the biggest cuts was a protracted "ethnic dances" sequence following one of the songs ("Portobello Road", a haunting, minor-key tribute to the infamous street market), and while the dancing is exuberant and fairly well-shot - I hate to admit it, but it's much more cinematically credible than the sometimes choppy "Step in Time" routine in Mary Poppins - the sequence stops the film dead, right smack dab in the middle. 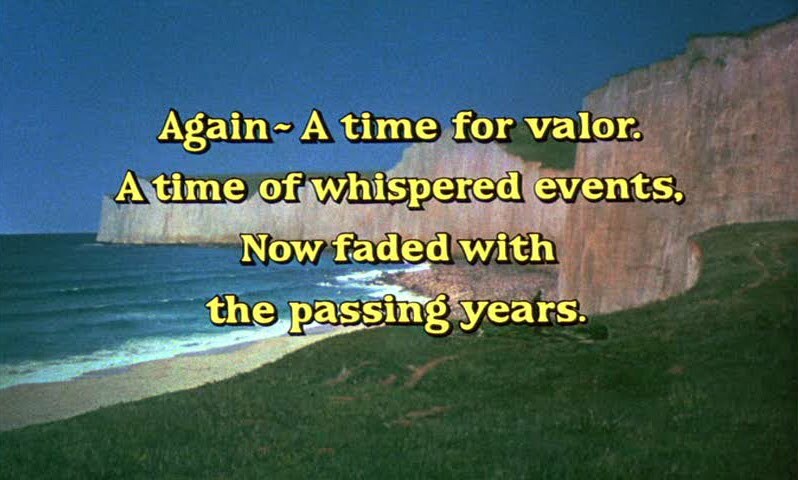 And that's to say nothing of the problem raised by the quality of the restored material, which ranges from fine (most of it) to grainy and washed-out (that same dance sequence, which was taken from workprints that were not color-corrected until 1996). And several of the scenes lost their original audio, and had to be redubbed by new actors (Lansbury and McDowall reprised their roles), which works almost all the time, and works not at all in the case of poor Emelius Brown, whose new voice - I will not do him the dishonor of naming him - sounds like Tomlinson's in that they are both English and male. The effect is exactly the same one you get when you're watching a crappy dub of a Japanese movie imported in the '60s, and it has a much more deleterious effect on the movie than such a slight flaw ought to. All of this has only a little to do with the movie itself, though, which is on the whole a perfectly appealing fantasy, with a perfectly appealing story of a makeshift family learning to work together. The alleged plot is the least interesting part of the whole: what the climactic battle against the Nazis has in outstanding effects (if you're willing to silently overlook the occasionally obvious wires) and unexpectedly grand scale it lacks in any strong emotional connection to the rest of the movie, unless the subplot that has thus far been most interesting to you is that of Miss Price's lack of confidence as a witch. Better by far are the quiet moments at home, so to speak, in which Lansbury and Tomlinson get to demonstrate their entirely unanticipated chemistry, while just giving all-around good performances. Lansbury's comic discombobulation is the soul of this light, fluffy movie, intensely undemanding and never "above" us the way that Julie Andrews's Mary Poppins was (Andrews was offered the role of Miss Price, but turned it down, not wanting to be typecast; by the time she changed her mind, Lansbury had been cast). Indeed, much of the reason that Bedknobs and Broomsticks is a stronger narrative than Mary Poppins is precisely because Eglantine Price is such a wreck, in some ways: while nothing short of a nuclear explosion could muffle Poppins, Miss Price is like us, yearning and hoping and making a mess of things and trying again. Tomlinson's Brown is a perfect foil, worldly and smart and about as nonthreatening as any cad in movie history, and as much as it's Lansbury's movie, it needs a confident rake in Brown's role to keep it from tipping into stickiness. Together, they form two of the three legs upon which the film's resolutely anti-dark tone rests: the third being of course the songtrack by the Sherman Brothers, which suffers only in comparison to Mary Poppins. On its own, it's almost certainly the finest original film musical of the 1970s, a category in which it has, admittedly, not much competition. No, there is no "Feed the Birds", nor a "Spoonful of Sugar". Still, the numbers are as catchy as the notorious Shermans could manage: beyond "Portobello Road", with its uncharacteristically slithery lyrics, the stand-outs to my mind are "Eglantine/Don't Let Me Down", a heavily Americanised attempt at a music hall ditty, "The Beautiful Briny", a leftover from an abandoned concept for Mary Poppins, and best of all, "Substitutiary Locomotion", this film's game attempt at a "Supercalifragilisticexpialidocious", with a load of nonsense words married to a march-like tune that reminds me of the "One Little Spark" theme composed by the brothers for the Imagination pavilion at the EPCOT theme park. The film's big animated setpiece was plagued by conceptual problems in development, and despite being the great Ward Kimball's first major projects in years - he directed the sequence, after spending most of his career since the '50s making strange, highly personal little shorts with Walt's blessing, the freest hand any animator was ever given at the studio - it's handily the weakest part of the film. Depicting an island of magic animals playing soccer, it is an awkward precursor of the similarly zany animal comedy of Robin Hood, released two years later, much too long and not terribly funny except in fits and starts; worst of all, the human actors are all visibly uncertain what they're supposed to be doing. And coming as it does in the early-'70s, it's an example of Disney animation at its very ugliest: sketchy graphic art that has little personality (beyond a certain Kimball-esque dryness to the design and comic timing) and no grace. Outside of the cartoon sequence which ought to be its most enchanting touch, Bedknobs and Broomsticks is actually quite good fun: a rarity for Disney in the years 1967-1989, though better films than this can be found from that period (and a great many more worse can be found if you're willing to look: the company does a good job of hiding its skeletons). It's not the most robust Disney entertainment for a grown-up, perhaps, and its frothy use of a magical realist WWII is kind of staggering; but charming, as well. And it's that charm, a Yankee idea of what rural British life is like, all well-meaning clichés and chipper attitude, that elevates Bedknobs and Broomsticks to the level of a minor classic; no more, but definitely no less.